Last week, I wrote about the role of speed in determining the greatness of past and present thoroughbreds. This week, I'm going to examine the role of speed in determining the greatness of past and present thoroughbred handicappers. As many people know, speed, at least as defined by raw time, was generally not thought of as a major handicapping factor in the early years of the Sport of Kings. No less a horseplayer than George E. Smith, aka “Pittsburg Phil,” called time “a minor consideration.” Instead, players like Phil and Charles Botay, both of whom have been credited with creating the first results charts, relied on things like weight, class and form to guide their wagering decisions. However, it should be noted that, back in those days, track conditions varied greatly, making simple time comparisons somewhat dubious. For example, Sir Barton, the first Triple Crown winner, captured the 1919 Kentucky Derby in 2:09-4/5 — more than six seconds off the track record at the time — over a Churchill Downs strip that was rated as “heavy,” a designation that is rarely (if ever) used anymore. A little more than a month — and two races (oh, how times have changed) — later, the Harvey Guy Bedwell trainee shaved two fifths of a second off the track record for 1 3/8 miles at Belmont Park in the Belmont Stakes... not surprisingly, over a “fast” track. Ironically, it was a Daily Racing Form employee (the DRF founder, actually) that was among the first to advocate the use of speed figures. But the revolution in speed figures that came years later (in the 60s and 70s), which fundamentally altered the game, at least from a handicapping perspective, appears to have reached its point of diminishing returns… and may have done so many moons ago. In the September 1997 issue of the now-defunct “Meadow’s Racing Monthly,” handicapping legend Barry Meadow presented a study by Jim Bayle of SportStat that suggested Beyer figures, which debuted in the Daily Racing Form in 1992, held a significant edge over the old DRF speed ratings (and associated track variants) as a predictive tool. Yet, even before Bayle’s survey, Beyer was questioning the effectiveness of his own figures in what he called “the computer age” (back when Windows 3.0 was all the rage). In “Beyer on Speed,” the author told of a fateful visit to Gulfstream Park in 1990. “In his nine-race career, Memorable Skater had finished out of the money nine times against maiden competition,” Beyer continued. “Now he was running against winners, and any traditional handicapper would have dismissed him on those grounds alone. But his speed figures were competitive with those of his rivals, and, in his last start, he had been forced to race wide on a track with a strong rail-favoring bias. … When I went to the track that day, prepared to make a killing, I thought Memorable Skater embodied all of the handicapping skills I had spent a lifetime learning. “The race went just as I expected. Memorable Skater popped out of the gate, angled to the rail, led all the way to win by six lengths — and paid $6.20. “A pitiful $6.20,” Beyer lamented. Unfortunately for speed-oriented handicappers like Beyer, races featuring overbet “figure horses” have become commonplace in today’s game, leading many to view time in much the same light that Pittsburg Phil did over a century ago. As speed figures lost their pari-mutuel punch, Beyer and others attempted to find other uses for them. Hence, goofy ideas like the “bounce theory” were spawned. Worse, with the advent of all-weather tracks and the rising popularity of turf racing, both of which bring pace into the equation to a much larger extent than races on dirt, Beyer numbers as well as other speed figures started to look more and more like performance ratings. How else does one explain the nonsense that occurred at Belmont Park on Sept. 17? Before I discuss the chart above, let me provide some background: In a piece that appeared in American Scientist in 1981, Peter S. Riegel showed that fatigue in human runners could be expressed, more or less, in a linear fashion. Later, Dr. Steven Roman found a similar truth regarding thoroughbred racehorses and, in fact, used the relationship between internal race fractions and final race times to determine that Secretariat most likely broke the track record at Pimlico in the 1973 Preakness Stakes — something that Daily Racing Form clockers asserted he did, while Pimlico officials maintained he did not (Big Red’s official time of 1:54-2/5 is based on Pimlico clocker E.T. McLean Jr.’s hand-timed account). 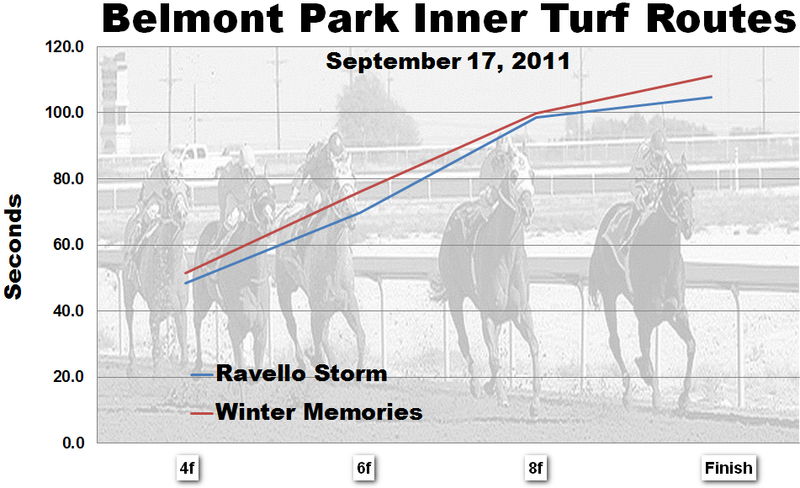 With that in mind, check out the graph above, which displays the race fractions and final times of Ravello Storm, who won a $20,000 maiden claiming affair over the inner turf at Belmont Park on Sept. 17, and Winter Memories, the three-year-old filly phenom who won the Grade I Garden City Stakes over the same course, at the same track, on the same day. 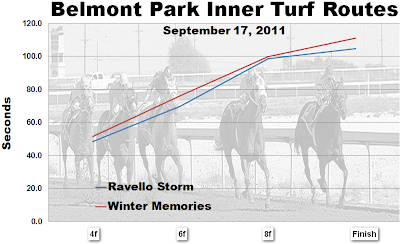 Notice that Ravello Storm ran faster at every comparable point in the race, including the finish. See what I mean about speed figures morphing into performance ratings? There is simply no mathematical basis for assigning Winter Memories a higher speed rating than Ravello Storm. What’s more, the run-up distance (the ground covered prior to the official start of the race… and the clock) was 12 feet in Ravello Storm’s race and 72 feet in Winter Memories’ contest. So, was Pittsburg Phil right, is time just a minor consideration? Well, if one believes pace and trip are minor considerations as well, the answer appears to be yes. We Provide assignment help online services likes as manage the assignments in colleges and university. Allassignment help is number 1 assignment help online in US, Australia.